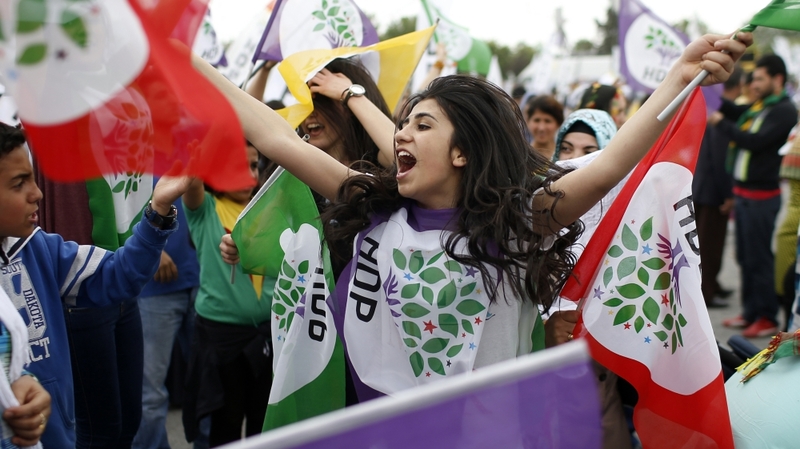 The left-wing, Kurdish-led HDP won 80 seats in Turkey's June 7 parliamentary elections, depriving the ruling AKP of an overall majority. This has forced new elections on November 1. The government's response has been escalating violence and repression. Turkey is increasingly drifting into a civil war. Political violence, led by the AKP provisional government, has escalated after the general elections of June 7. Today, the peace and negotiation process between the Kurdistan Workers Party (PKK) and the Turkish state has come to a halt and war has started again. Just within the last month, severe clashes have taken place in many Kurdish cities, such as Silopi, Lice, Şemdinli, Silvan, Yuksekova and Cizre, where the civilian population has been targeted by state forces. Tens of civilians, guerrillas and members of state security forces have died in the ensuing clashes. Since July 24, the AKP interim government has not been attacking ISIS, as it claims to be doing, but instead has been attacking the Qandil Mountains in the territory of the Kurdistan Regional Government, as well as Kurds, democratic forces, democratic politics, civilians, women and the opposition as a whole in Turkey. The Turkish state and the provisional AKP government are implementing all sorts of oppressive measures, such as forbidding entry into and departure from Kurdish cities against which it launches military operations. It has cut off all communication, including phone and internet lines, and blocked off press and observers to prevent the truth about what is happening on the ground reaching national and international public attention. A curfew has been in place for the past week in the province of Cizre, where 21 civilians have been killed. Cizre have been under siege for days. There is serious shortage of food, water, and access to basic health services. The siege has blocked treatment of the wounded and burial of those who have been killed by state security forces. Serious concerns regarding fears of civilian massacre in Cizre have been voiced by the elected members of the parliament and civil society organisations. In this very violent situation, the HDP has also been targeted by AKP spokespersons and pro-AKP mass media. Almost every day, our party officials and especially our co-chairs are being put on the target for those “nationalist and patriotic” people. Many calls and statements of AKP officials have been signalling for war against HDP. As a result of this violent discourse of the AKP, many of our buildings in several cities have been attacked by groups of people associated with racist and fascist groups. On September 8, they attacked our headquarters in Ankara, setting fire to the building. Our party archives and records were targeted specifically. No one was injured in the attack but our headquarters is now heavily damaged and unavailable for use. Until now, more than 128 party buildings all over the country have been attacked. Moreover, the police and other security forces of the state did not do their job to prevent the attacks. We once again want to emphasise that HDP is not a part of these violence-based, war-oriented policies. As the HDP, we did not take part in any decision-making process of the war. On the contrary, we are trying to push both the PKK and the Turkish state to end this armed conflict. It should be known that it is the AKP who is insisting on war politics and implementing anti-democratic practices all over the country. In spite of these adverse developments, we call on all international communities, civil society organisations and the international media for solidarity and support to bring about an immediate ceasefire and the commencement of peace talks. Our call is also one for urgent action against increasing state violence, the violation of human rights and anti-democratic practices and measures in Kurdish cities as well as the cities in the western regions of the country. We now need the support of the international public more than ever in order to achieve the realisation of a lasting peace in the Middle East, Turkey and Kurdistan. In this context we invite all of our friends, political parties, associations, networks, civil society organisations and all peace-loving forces to act in solidarity with us. We call on all democratic international institutions and forces to take concrete steps against the Turkish state’s violent, anti-democratic actions against its own people and citizens.